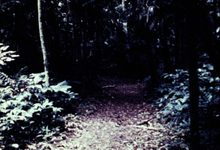 A stop-motion journey through a tropical forest, over rocky trails in search of an illusory connection to a manicured version of nature. At the foot of the Arenal Volcano, in a massive Costa Rican nature reserve, we are confronted with a wave of eco-tourism. The camera tries to escape, but a feeling of simulacrum lingers.